In celebration of the Centennial of Landscape Architecture at the University of Massachusetts Amherst, the University Museum of Contemporary Art will host The Intimate Expanse – Recent Works of Alumni of the Department of Landscape Architecture and Regional Planning – an exhibition of images projected on the gallery’s walls that express the breadth of the field of landscape architecture as revealed in the planning and design of the region, city, town, neighborhood, community, park, and personal garden. This exhibit runs concurrently with the Gallery’s Recent Acquisitions exhibit from February 1 through March 12 and reopens March 23 through May 14th.There will be a an opening reception for both exhibits Saturday, January 31st from 4-6pm. Over one hundred alumni of what is now the Department of Landscape Architecture and Regional Planning are represented in the exhibition by images of projects in research, planning, design, and implementation that extend across the United States and into Europe and Asia. The exhibition is held in three of the gallery’s spaces with each room devoted to a different kind of projection: The Landscape Documented, The Garden of Expression, and Landscape Animated. The Landscape Documented presents sequenced projections of images and texts describing the range of UMass alumni works, including Stephen Stimpson, Shane Coen, Patrick Condon, Paul Bukus, Ellin Goetz and Frank Sleegers. 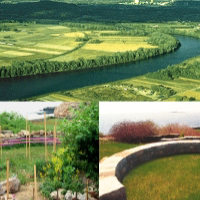 Also included are examples of historic research and restoration of significant landscapes, such as a James Rose garden, by teams of UMass alumni under the creative direction of Dean Cardasis; documentation of construction processes by alumni in landscape contracting from the UMass Stockbridge School of Agriculture, under the guidance of Michael Davidsohn; New England town planning by Zenia Z. Kotval; and research on regional landscape patterns by Jack Ahern. These and many additional landscape images with text are projected at different speeds and times on the gallery’s walls creating a dynamic and ever-changing light show. The Garden of Expression is a serial compilation of images projected and overlapping on the walls, floor, and ceiling of the north gallery, which are altered by the viewer’s passage through the space. The finite images are controlled by random timing sequences, reflecting the dualities of control and chance in our experiences of the landscape. Animated Landform Spaces in the west gallery includes the digital imagery of Stephen Ervin. Ervin uses computer landscape modeling as a research tool to discover creative expressions in landscape patterns by exploring the landscape media of landforms, water, plants, and structures as they shape the form of landscape processes and define human spatial experiences. The Intimate Expanse is presented in memory of Barrie Greenbie (1920-1998), Professor of Landscape Architecture and Regional Planning at the University of Massachusetts Amherst. The exhibition is organized and designed by Joseph S. R. Volpe, Professor of Landscape Architecture and his BSLA ’04 undergraduate students Team 100YrsLAatUMass: Brendan Carey, Mathew Foley, Thomas Hand, Preston Holleman, Thomas Lipka, and Shane Mahoney, in cooperation with the University Museum of Contemporary Art . The exhibition has received generous support from the Department of Landscape Architecture and Regional Planning, the UMass Arts Council, and the UMass Alumni Association.